Addressing climate change, conflicts between food and energy supplies, biodiversity loss, demographic shifts and intensive land transformation requires innovative and regionally adaptive solutions. The research programme “Sustainable Land Management”, funded by the German Federal Ministry of Education and Research (BMBF), aims to produce new knowledge for effective decision-making in the area of land and natural resource management. The programme integrates science and practice in order to develop new strategies, technologies and system solutions based on examples from selected regional case studies. The funding measure is part of the BMBF framework »Research for Sustainable Development« (FONA) and contributes to the implementation of the sustainability strategy and climate protection goals set by the federal government. All regional projects (figure 1) in the international Module A of the ‘Sustainable Land Management’ programme are coordinated by the Scientific Coordination and Synthesis GLUES (Global Assessment of Land Use Dynamics, Greenhouse Gas Emissions and Ecosystem Services). The projects address interactions between land management, climate change and ecosystem services. The main purpose is to identify key functions provided by natural resources that are indispensable to sustainable and climate optimised land management. 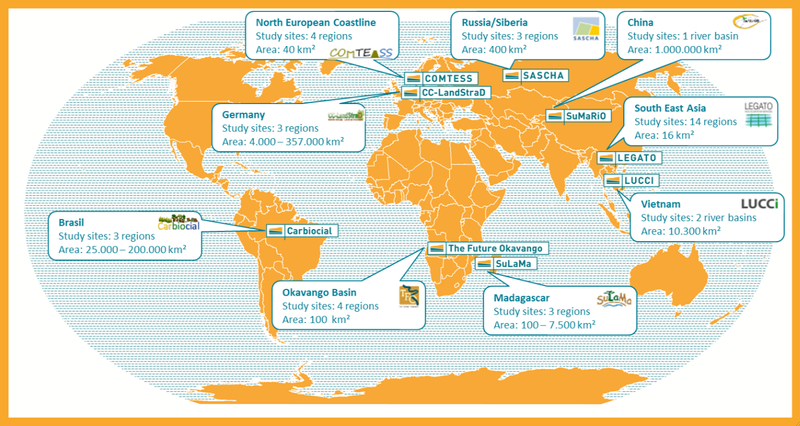 The map shows the distribution of the regional projects of Module A of the research programme ‘Sustainable Land Management’.